The Greek goddess Athena was born when her father, Zeus, experienced an enormous headache. She sprang fully grown and wearing battle armor from his forehead. SHE IS THE GODDESS OF MANY THINGS, BUT MOST NOTABLY OF WARFARE, STRENGTH AND HEROIC ENDEAVORS. 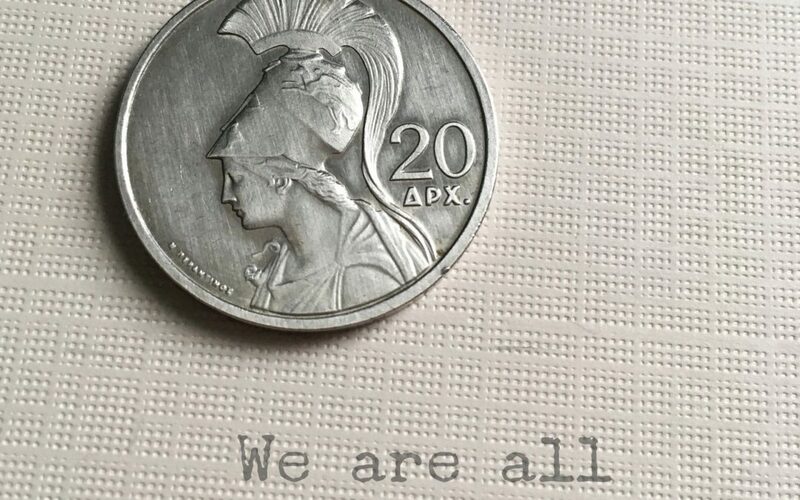 This Greek coin is so beautiful! It features a portrait of Athena dressed and ready for battle. 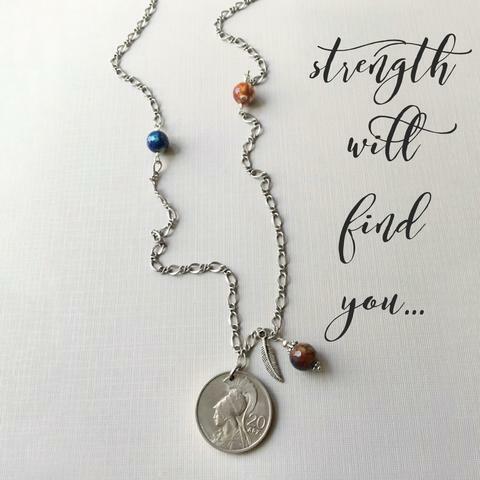 STRENGTH AND COURAGE IS THE THEME FOR THIS PIECE! There are so many little details that I get excited about that not everyone notices so I thought it would be fun to show you how much heart I put into these designs. 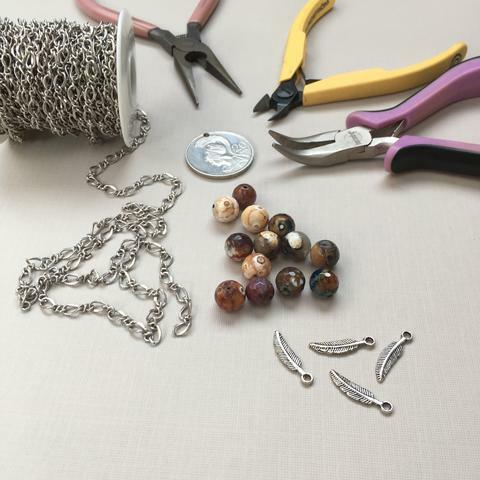 Here, I wanted to show you the rest of the bits that make the whole necklace. The beads are agate. I chose blues, browns and reds. Earthy grounding colors. I have a gem book that lists natural stones and their properties. The feather charm is a symbol too. Native Americans used eagle feathers as symbols of strength and courage. Last but not least, I love this antiqued silver chain which is feminine and strong at the same time. Sometimes I think about what my place in the world is. Sometimes I think the business of making jewelry is silly. I have wondered if there might be something more important I ought to be doing to help people or serve the greater good. And then I get a message like this one I’m about to share with you. AND I THINK THAT MAYBE I’M PROVIDING A TANGIBLE WAY IN WHICH OTHER PEOPLE CAN SHOW LOVE AND SUPPORT TO PEOPLE THAT NEED IT. And if by wearing the jewelry that I made, they remember that they are loved… it makes what I do a little more meaningful. So maybe it’s ok if I keep doing it. I have been searching for the perfect piece of jewelry for a dear friend of mine who suffers from Lupus. She was only diagnosed 2 years ago (shortly after she married) and has since been struggling with constant flare-ups and infertility. I hope the necklace comes with the print-out of the description because that message would really touch her heart.